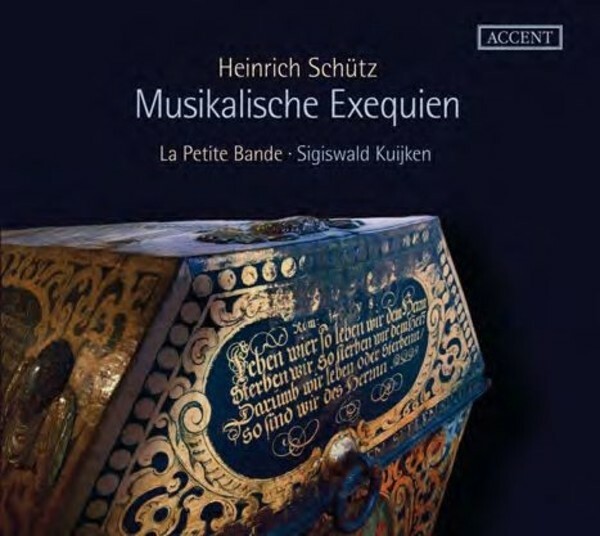 Heinrich Schütz composed the Musikalische Exequien SWV 279-281 for the funeral of his patron Prince Heinrich Posthumus Reuß 1635/1636. Of the three parts, which were to be performed during three different sections of the funeral service, the first part, in the form of a sacred concerto for choir and soloists, is based on the numerous biblical passages which, in accordance with the instructions given by the deceased were to be recited at the coffin, which the deceased himself had designed during his lifetime. This part is followed by a motet for double choir based on the text of a sermon ("Herr, wenn ich nur dich habe"), and at the conclusion of the hymn of praise to Simeon ("Herr, nun lässest du deinen Diener in Frieden fahren"), a choir apart from the main choir intones "Selig sind die Toten" from heaven, so to speak. With this composition, written as a commission, Schütz created one of the most artistic and heartfelt works of mourning ever written in the history of music.